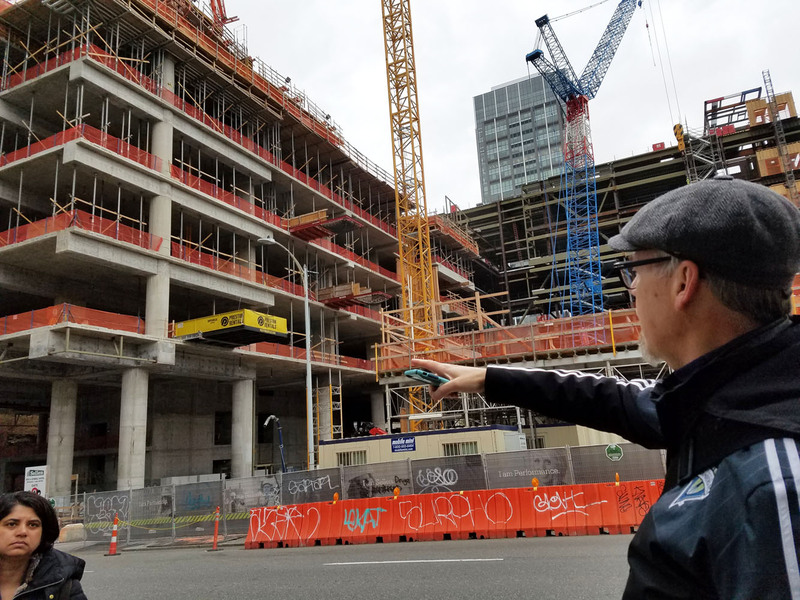 As all construction sites are, the building going up at Ninth and Howell in downtown Seattle is a formidable and intimidating sketch subject. But David Chamness promised us “freedom from worry and the details” as we tackled the site in his USk 10x10 workshop. He encouraged us to stay loose and fast with the sketch while having fun and engaging with passers-by. 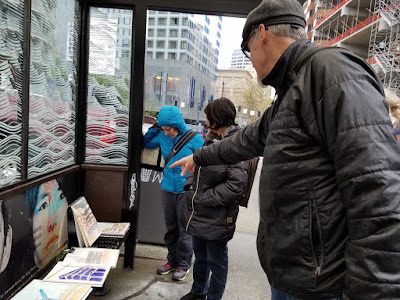 On a cloudy but fortunately mostly dry morning today, a dozen of us began by making small thumbnails to divide the intimidating scene into manageable compositions. David suggested taking smartphone photos to help us view various compositions. Giving a brief drawing demo, he explained how to identify the horizon line and vanishing point and how to take relative measurements of elements and angles with our pens. 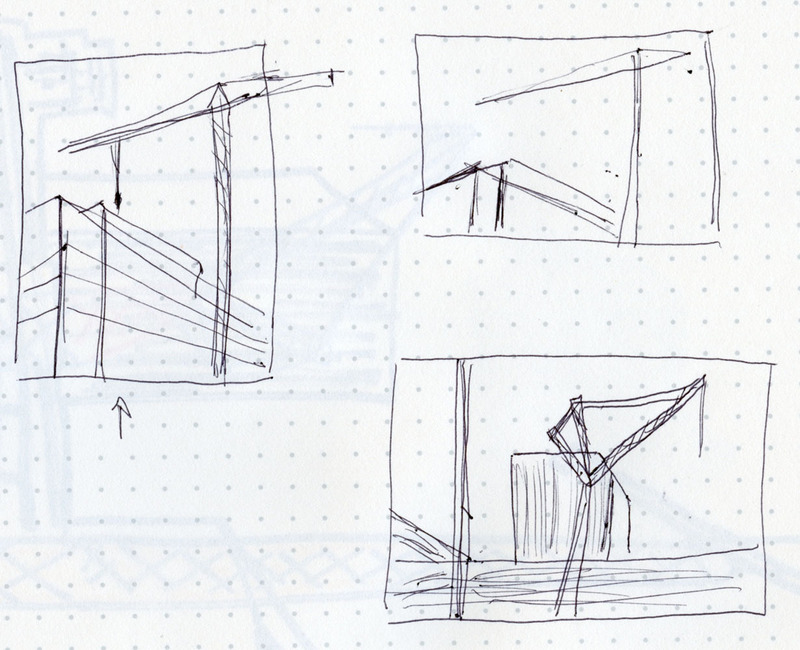 Next we drew a complete scene using one of our thumbnails as a reminder of the composition. (“Look at the thumbnail briefly, then put it away and look at the actual scene while you draw,” he said, “don’t draw from the thumbnail.”) David urged us to draw with bold, confident ink lines, not dashed, sketchy pencil lines. 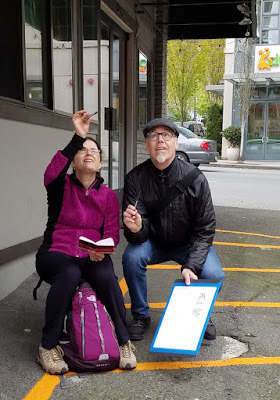 (“You don’t want to draw it twice or spend time erasing.”) As we drew, he gave us more pointers like using the whole arm – not just wrist – to draw long, straight lines, and using the “rule of thirds” to make interesting compositions. 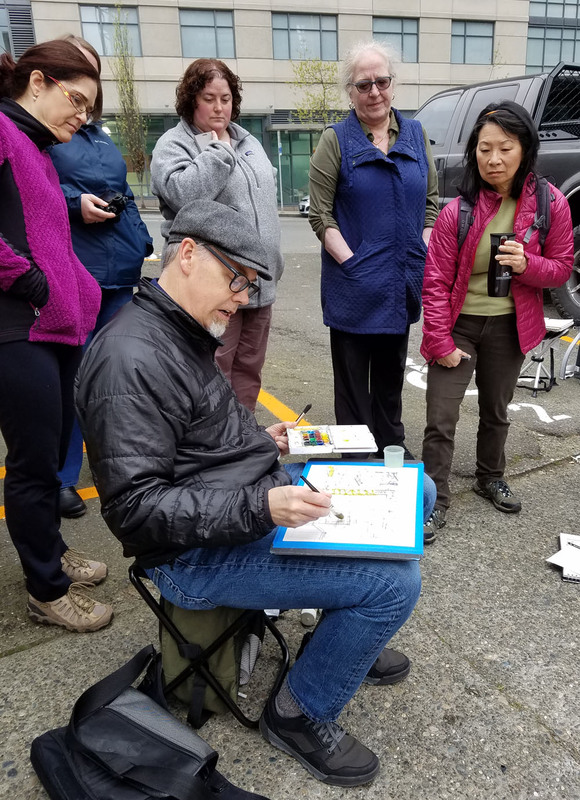 David giving a watercolor demo. Shown at the top of the post is my final sketch. 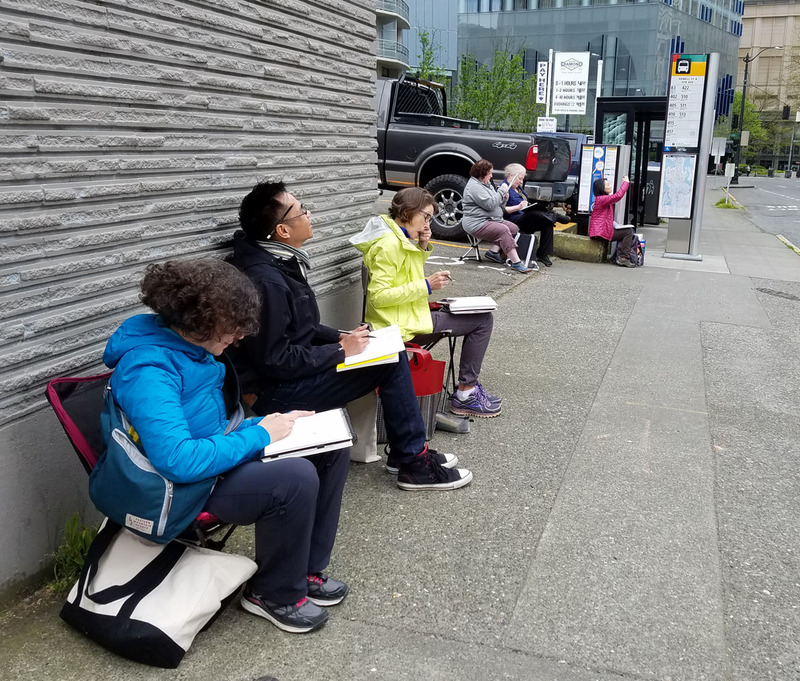 Whenever I take workshops, I usually end up feeling like the resulting sketches are not my spontaneous responses to the subject because they are assigned by the instructor, who has a specific objective in mind for the exercise. I maintain the attitude, however, that I’m there to learn more than to make spontaneous sketches, so the results don’t bother me. I have to say, though, that this sketch is one of few workshop sketches I actually like because it did feel like a genuine, fresh response. 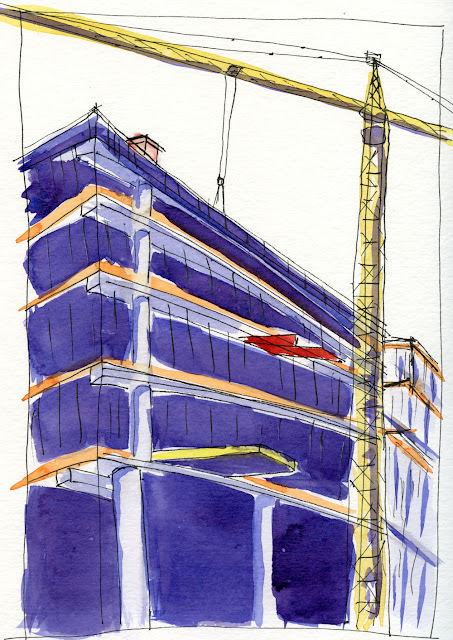 Influenced by David’s approach and feedback, it is looser and bolder than most scenes I’ve sketched under the duress of being intimidated by huge and complex subject matter. Free of worries, indeed! Workshop students hard at work. 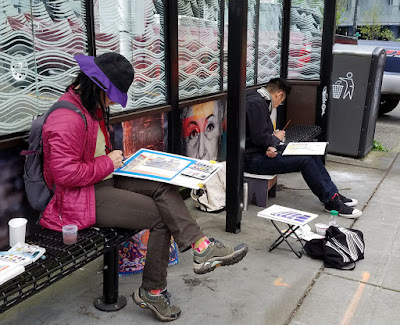 A bus shelter makes a handy studio. David helps Svetlana take a measurement. Good report... maybe I should have gone, but I had so much else on this date! It was a terrific workshop! I feel lucky to get in on the 10x10 series. Nice going Tina! 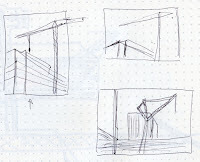 You show that you are an attentive student and your sketches reflect your understanding of even difficult subjects. I love your reports about the classes. Thank you.